Significant associations between candidate genes and six major cotton fiber quality traits were identified in a MAGIC population using GWAS and whole genome sequencing. Upland cotton (Gossypium hirsutum L.) is the world’s major renewable source of fibers for textiles. To identify causative genetic variants that influence the major agronomic measures of cotton fiber quality, which are used to set discount or premium prices on each bale of cotton in the USA, we measured six fiber phenotypes from twelve environments, across three locations and 7 years. Our 550 recombinant inbred lines were derived from a multi-parent advanced generation intercross population and were whole-genome-sequenced at 3× coverage, along with the eleven parental cultivars at 20× coverage. The segregation of 473,517 single nucleotide polymorphisms (SNPs) in this population, including 7506 non-synonymous mutations, was combined with phenotypic data to identify seven highly significant fiber quality loci. At these loci, we found fourteen genes with non-synonymous SNPs. Among these loci, some had simple additive effects, while others were only important in a subset of the population. We observed additive effects for elongation and micronaire, when the three most significant loci for each trait were examined. In an informative subset where the major multi-trait locus on chromosome A07:72-Mb was fixed, we unmasked the identity of another significant fiber strength locus in gene Gh_D13G1792 on chromosome D13. The micronaire phenotype only revealed one highly significant genetic locus at one environmental location, demonstrating a significant genetic by environment component. 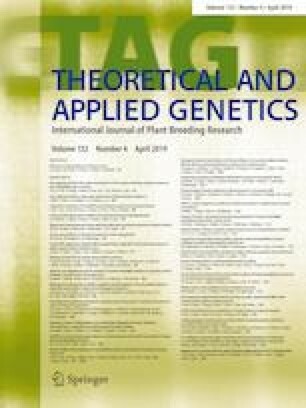 These loci and candidate causative variant alleles will be useful to cotton breeders for marker-assisted selection with minimal linkage drag and potential biotechnological applications. The online version of this article ( https://doi.org/10.1007/s00122-018-3254-8) contains supplementary material, which is available to authorized users. This research was funded mainly by the USDA Agricultural Research Service CRIS Projects 6054-21000-017-00D (GNT, DDF), 6064-21000-016-00D (JNJ, JCM), 6066-21000-051-00D (LZ), and 6082-21000-008-00D (BTC). Additional funding was provided by Cotton Incorporated Projects 10-747 and 15-751 awarded to DDF, and Project 09-541 to JNJ. Mention of trade names or commercial products in this article is solely for the purpose of providing specific information and does not imply recommendation or endorsement by the USDA which is an equal opportunity provider and employer. All relevant data reported in this paper are within the paper and its online supplementary files.